Scotland Office Minister David Mundell and Advocate General Lord Wallace of Tankerness QC, welcomed the Moderator of the General Assembly of the Church of Scotland to Dover House for the Moderator's lunch as part of his annual visit to Westminster. Scotland Office Minister David Mundell and Advocate General Lord Wallace of Tankerness QC, welcomed the Moderator of the General Assembly of the Church of Scotland to Dover House today, for the Moderator’s lunch as part of his annual visit to Westminster. 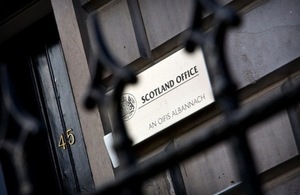 David Mundell said: “It is always a pleasure to welcome the Moderator to the Scotland Office, was has been an annual tradition for over 50 years”. “Mr Bogle is a man of many parts, through Facebook and Twitter he has embraced the opportunities offered by social media to provide the wider community with a unique insight into what the role of the Moderator entails”. The Right Reverend Albert Bogle led an ecumenical service in the Crypt Chapel of the House of Commons which featured a lesson delivered by Lord Wallace. He then attended Prime Minister’s Questions at the House of Commons.